Drama queen: On November 18th, Sofia participated in her very first drama performance. It was the culmination of her first drama class at Studio East. She and her classmates acted out several stories while the teacher read them, including Where the Wild Things Are. Sofia loved the class—and she was great as a wild monster! 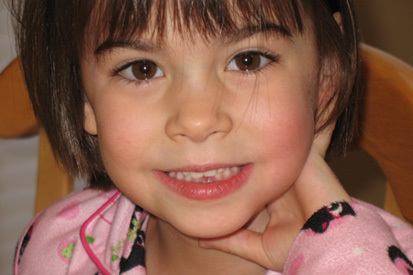 Holes and fairies: On November 15th, after a couple weeks of wiggling and jiggling, Sofia lost her first baby tooth. She was extremely excited. To leave it for the tooth fairy, she entrusted it to her special tooth fairy doll, which she left sitting on her pillow. Just in case, she also drew up a sign saying "Sofia's tooth" with an arrow, which the taped to the head of her bed. The tooth fairy didn't fail; she left Sofia $3 under her pillow. Sofia decided that she wanted to put all three dollars into the "Share" portion (rather than "Save" or "Spend") of her divided savings bank. Sofia the morning after her tooth came out. Best of the best: On November 4th, Cameron performed in the 2009 All-District High School Honor Concert with the District Honor Band. Members of the 65-member band (like the orchestra and choir) were selected from the best musicians in each of the district's high schools. The band played Prelude, Siciliano and Rondo by Malcolm Arnold, Bloom by Steve Bryant, and Trail of Tears by James Barnes. Cameron had a beautiful solo in the first piece and walked half-way across the gym to play the bugler's cavalry charge during the third piece. Needless to say, and although Cameron remained irritatingly modest, his parents were very proud. 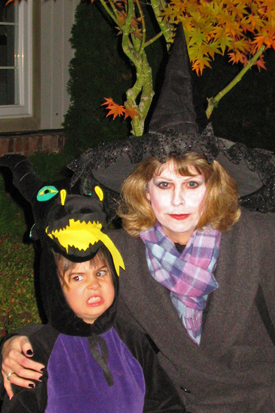 Boo and more boo: Sofia had a great time trick-or-treating Halloween night. She growled her way from house to house in her magnificent Maleficent (the Sleeping Beauty dragon) costume, remembering to politely say "thank you" at each door. By trick-or-treating two times in two days, she bagged enough candy to last a year! Then, with a babysitter at home, Amy and Jan went to the Left Foot Boogie Halloween Ball at the Sons of Norway Hall in Bothell. Amy had taken a class to learn a choreographed waltz that was performed at the ball during a band break. Dressed as a "corpse bride" (Jan was all in black) she fit right in with the many other wonderful and crazy costumes at the ball. In the meantime, Cameron and Emily, dressed as Little Red Riding Hood and the wolf, spent the evening at a friend's party. It was one of the best Halloween nights for all of us! Scary preparations: The family did a number of fun activities leading up to Halloween this year. Sofia's Montessori hosted a pumpkin-carving night at which Sofia designed and Amy carved the family's large home-grown pumpkin (it grew out of our compost bin). Amy also took the day off from work to help with Sofia's class Halloween party, including decorating cookies and hunting for confetti left on the playground by the Halloween fairy. As in years past, we also visited the South 47 Farm and, somehow, made our way through the wilting corn maze. The day before Halloween, Sofia trick-or-treated at grandma's retirement home, delighting all the residents with her dragon costume. And the morning of Halloween, Sofia brought cupcakes to Oranjeschool that she decorated herself with orange frosting and liberal amounts of Halloween sprinkles. Living the Beach life: On July 5th of this year, Amy and Jan began the South Beach diet. Eventually, Amy lost 10 pounds, and Jan lost 24, not only looking thinner but feeling healthier. We're now proselytizing about South Beach to whomever will listen. South Beach involves, most importantly, eating far fewer sugars, as well as fewer and higher quality carbohydrates (for example, whole grains, brown rice), and the right kinds of fats. Hunger is not an issue, but we've spent some time learning about eating healthier. Maintenance has also not been difficult, as we've found South Beach easy to adopt as a "lifestyle" rather than just a temporary diet. In fact, Amy's primary problem—and she's not complaining—has been finding smaller pants in the clothing stores! Land of extremes: In mid-October, after reading several books by James Clavell about Hong Kong (Taipan, Noble House), Jan took a 15-hour plane ride and spent nine days sightseeing in and around Hong Kong. He found Hong Kong to be a city of extremes: extreme buildings, extreme views, extreme traffic, extreme crowds, exhausting for the senses but simultaneously pleasant. It was larger than he expected, but the public transportation was efficient (and affordable), making it easy to visit many areas. 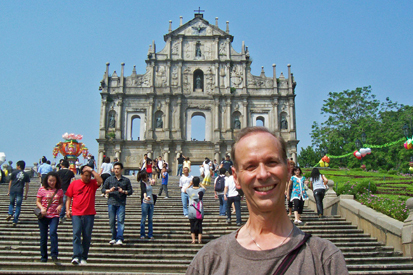 He walked around the original Hong Kong island, where it all began, plus the Kowloon area, across Victoria Harbor . He also visited one of the outlying islands, Lantau, which was worthwhile (he did not go to Disneyland there), as well as the New Territories , with its own attractions such as Buddha Temples, markets, parks, and beautiful bays. He did not see any poverty and felt very safe. Other highlights included swing dancing in Hong Kong, shopping in Shenzhen (Guangdong, China), Star Ferry rides, double decker tram and bus rides, Victoria Peak , the Lady's market, and mid-level escalators. He thoroughly enjoyed the trip (except perhaps the difficult task of figuring out what food was being offered) and hopes to be Amy's and Sofia's guide in the future. Coming home: For Cameron's Homecoming Dance this year, Cameron and Emily wanted to save money for bigger events yet to come (like Senior Prom). Even though Cameron did rent a tux (and looked smoooth), the kids used Mom's car for transportation and, most importantly, ate dinner at Café de Rie. Dressed in black and white waiter togs, Amy served Cameron, Emily, Claire, Alanna, and Matt in a thoroughly decked-out dining room a four-course dinner of bruschetta; green salad with strawberry vinaigrette; salmon, garlic mashed potatoes, and cheese broccoli; and cheesecake with strawberry sauce. Diet Coke was poured in the wine glasses. The parents came over for formal photos, the young men and ladies enjoyed their meal, and then off they went to a movie and the dance. New beginnings: On Wednesday, September 2nd, Cameron started his senior year of high school. (Amy volunteered to hand out student schedules and got to be there for his last first morning.) He'll be taking advanced calculus, American history, AP English, mechanical engineering, physical education (required by state law for graduation), health (via Internet in order to fit it in his schedule), Symphonic Band, and Jazz Band. On top of that full schedule, he has elected to build a go-cart for his senior project, and he has college applications to fill out his first quarter. With 15 hours working at Target each week, Cameron will be one busy guy! On Tuesday, September 8th, Sofia began kindergarten. She was very excited about all of it: excited to wear new clothes, to see her teachers again (to whom she gave big hugs), to see old and new friends, and to begin learning and accomplishing important big-girl work. "Are you ready for school?" we asked. "Yes, I am!" she replied definitively. She's prepared for a very good year.